I’m still suffering from my crappy cold. Ted drove. It was a pretty uneventful day. To be very honest – this part of Texas is not very scenic. I was very much looking forward to our arrival in Louisiana. I found Prejean’s Restaurant on the Google search – looked like a great place for a good Cajun dinner! So I found a hotel to complement the location and we had a plan. Prejean’s was great! We ate a lot of crawfish! They had live music. Wait staff were perfect. Local draft beer! A great evening…. Until we got back to the car… Apparently Andi had eaten something disgusting within the past day. Poor girl. We cleaned up poop. Reassured our girl that it was all ok – and then went on as usual. I felt terrible that she had to poop in the car. Poor girl…. Ted felt pretty badly too. She was still in some discomfort this morning (Thursday). We have fed her lightly and stopped often. 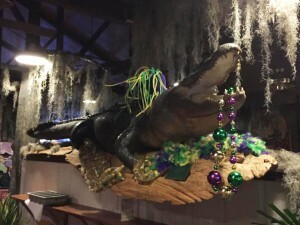 The Alligator on guard at Prejean’s in North Lafayette.